I read the first book in this series not too long ago as part of the October Readathon, initially picking it up because I thought the pictures would help if my eyes got tired. I really wasn’t expecting to like the book as much as I did and I’m so glad that I knew I had the second one on its way as I was finishing it! The first book sees Jacob meeting Miss Peregrine and her peculiar children and learning more about the world that they live in and how he fits in that world. This second one continues the story after some rather dramatic upheaval is inflicted upon the Home for Peculiar Children in the final pages of the first book. I’m glad that I read the first and second books pretty close together. Although there are a couple of sentences that recap main events from the end of the first book at the opening of the second one, there isn’t anything too detailed so if it’s been a while since you read the first one, you might want to have a quick flick through the final pages of it or search out a quick summary before you get started on the next instalment. The interview with Ransom Riggs in the back of my edition of Hollow City describes how with the first book, the pictures mostly came first but with this second book, because the story was already so well advanced, the process was often the other way round; the words leading and the pictures filling out the details so I guess that it makes sense that overall I think I prefer the second book as a story but I prefer the first one as a reading experience, if that makes sense. One thing I’ve been impressed with in both books and really wasn’t expecting was just how good the writing is. I wasn’t expecting it to be bad but I also wasn’t expecting it to be noticeably good. It’s really easy to read and the pages absolutely fly by (helped along by the regular pictures!) but it’s also beautiful in its way. It flows wonderfully and it has some really stand out moments that I actually skipped back half a page just to read again. Something about the tone just sets off the peculiar subject matter to perfection. It wasn’t quite a five star read for me because the plot was a little too…neat for me in places, even though that slightly twee feeling was thrown on its head towards the end. (Seriously, though, that ending!) I already have the next book, Library of Souls, ordered and I’m going to be picking it up as soon as I can, before I forget how much these characters tug on my heart strings and how badly I want to know how their stories turn out. Overall: This series has continued to surprise me, with this one throwing me completely off balance in the last few chapters. The pictures don’t feel gimmicky in the slightest; it all just works. I love how Riggs has taken some odd, discarded photos and built a world around them. 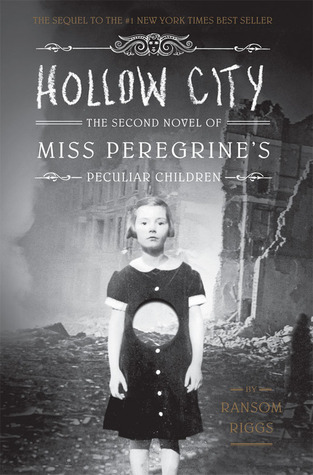 Hollow City takes that world and blows it apart and I can’t wait to see whether it gets put back together again. If you do fancy picking up a copy, you can compare prices over at SocialBookCo, a nifty website that shows you the current price of the book you want at most popular online stores (including Amazon, Book Depository and Wordery). Some of the books I’ve seen have varied in price by as much as £5 so it’s an easy way to save some cash on the run up to Christmas! Find Hollow City HERE.